This new amplifier is designed to combine high power output and high efficiency while simultaneously producing the high-fidelity audio Pioneer is known for. The GM-D7400M digital mono amplifier, intended for powering large subwoofers, uses digital technology that makes it 80-95 percent more efficient than conventional class A/B amplifiers. Due to the increased efficiency, the physical size of the new it more compact and easier to install. 100 % of the power, 45 % of the size� The superior efficiency of a Class-D amplifier means higher power output and greater compactness than an analog amplifier offers. Class-D amplifiers overcome the inefficiencies of traditional Class-A or AB amplifiers. 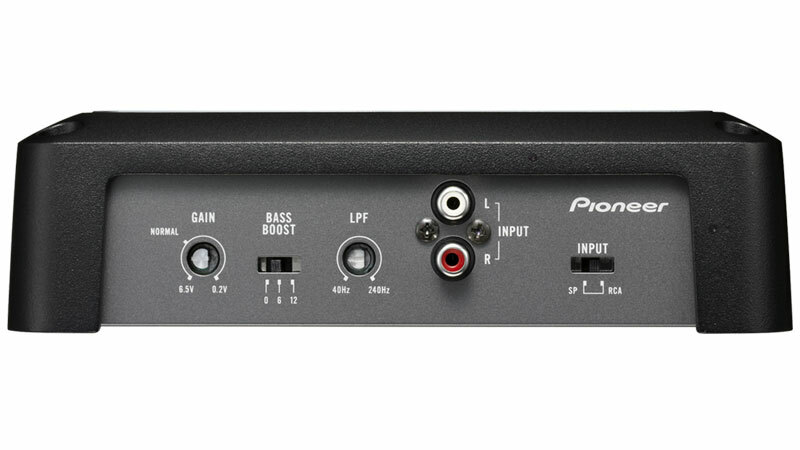 Pioneer�s Class-D amps transform very little power into heat so a higher percentage of the power supply (67%) is transformed into the load. This results in a very compact amp which needs less input power to produce very high output power. The Class-D amplifier�s PWM (Pulse Width Modulator) modulates the original audio input signal with a triangulated signal wave which has a much higher fixed frequency. The result is a digital signal which contains both the input signal and a band of frequency components around the modulation frequency. A LPF (Low Pass Filter) then filters out the high frequency pulses and the resulting amplified output signal is then sent to the subwoofer and/or speakers. Bass boost gives you more control over how your music sounds. It lets you set the optimal bass level for each speaker/sub connected to the GM-D8400M, so the tone controls from your headunit can do what they do best. And because this is selectable bass boost, you can set the level at 0dB, 6dB, or 12dB, whichever sounds best to you. Built into the GM-D8400M is a very smart crossover network. It works like a gateway, routing the big bass signals (adjustable from 40 to 240Hz or lower, at -12dB/octave) and filtering out higher-frequency signals to that subwoofer. This optimizes your systems efficiency and delivers the best possible sound quality. 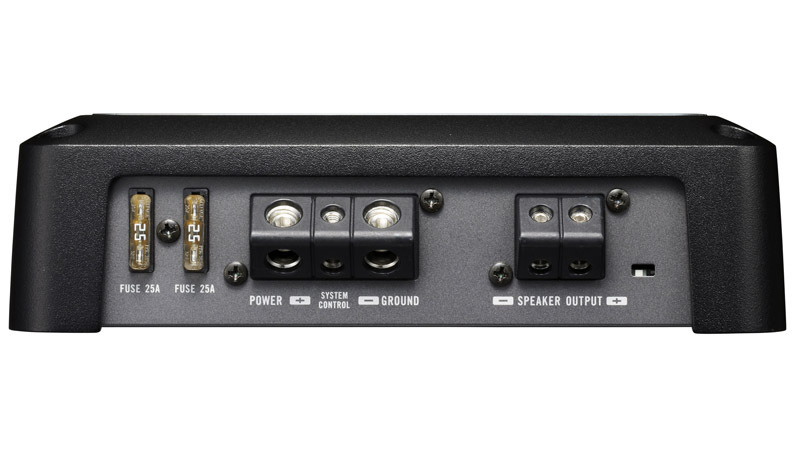 The GM-D8400Ms speaker level inputs allow you to connect your OEM unit (or any unit that does not have the typical RCA-type inputs) without having to buy add-on adapters. 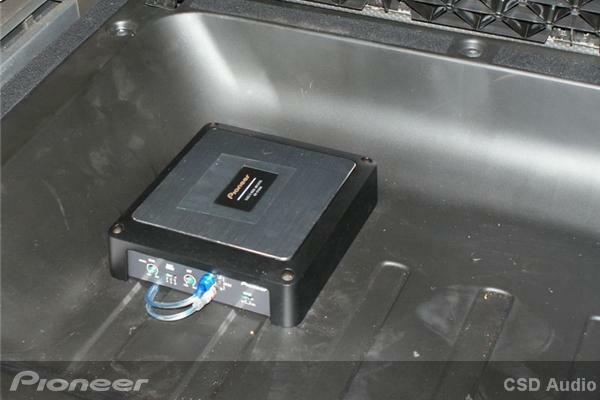 So, the install goes faster, you save money, and you have a Pioneer amp in your vehicle. Crossover Frequency Range: 40~240Hz, -12dB/Oct.